Northone TV asked us if they could use our R35 for a feature on 5th gear TV channel 5. GTR vs 911 Turbo to see which will be fastest round the track and best car of the day. we took our R35 GTR up to Anglesey. Ours is the first in the UK, not only first, it’s the first tuned as well. 5th gear actually contacted Nissan Europe, who couldn't provide them with a car ! 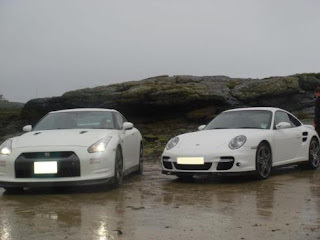 As 5th gear and Top gear have a big rivalry (top gear did GTR vs Bullet train on sunday) we were not really allowed to take any photo's and they would not tell us the exact times the two cars got round Anglesey due to confidentiality. Other than Bruno told us the GTR was way better and got the fastest time. I guess you'll just have to watch out for the feature when it hits TV scenes 25th Aug. This year my R35 has been filmed by 5th gear twice, front cover for Car magazine, cover Evo mag, all over news features in redline, max power you name it…invited down to Mclaren F1, seen at a major video game launch, attended loads of car shows..
Beautiful UK weather. Rain and lots of it.